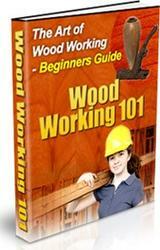 THE FACTS: A 28-year-old amateur woodworker was ripping a l-in.-wide strip from a 5-in.-wide board. He positioned the narrow strip between the blade and fence, as shown in the top photo. 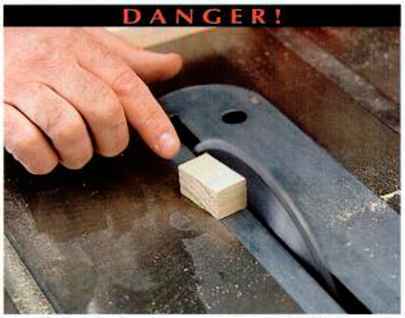 He had removed the blade guard and splitter, and was standing directly behind the workpiece. 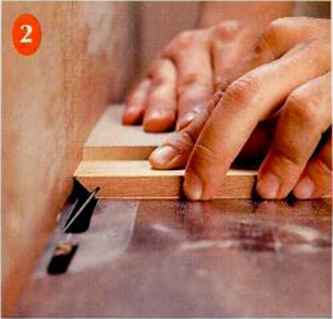 Rather than try to squeeze his right-hand fingers between the blade and fence to finish the cut, he switched to his left hand and pushed the waste side of the board. He saw the board "ride up on top of the blade and shoot back" at his chest. The board broke a rib and removed a large slab of skin. 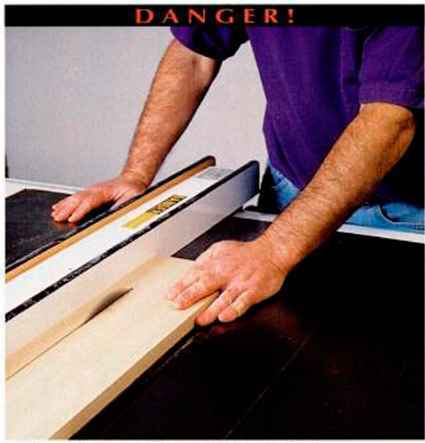 THE SAFETY LESSON: It's crucial to push only the portion of the board between the blade and fence. Keep firm pressure against the fence as you feed the board forward. (See bottom photo.) The left hand can guide the board too, but only up to a point even with the front of the blade. Always use a pushing device when the distance between the blade and fence is less than 6 in. And never stand directly behind the board— stay safely out of its path in the event of kickback. 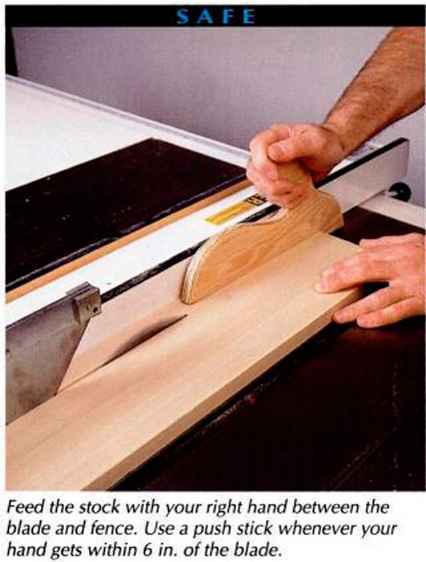 When cutting off a narrow strip, If possible, place the wider portion between the blade and fence, so that the narrow piece is on the "waste" side. If the strip is less than Vj in. wide, use a zero-clearance throat plate. GUARDS AND ACCESSORIES Most blade-guard assemblies include a splitter, which can help prevent kickback. Always use it when ripping! Feed the stock with your right hand between the blade and fence. Use a push stick whenever your hand gets within 6 in. of the blade.